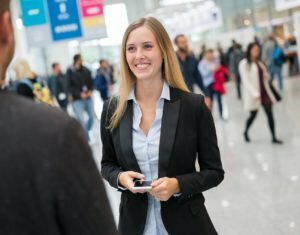 Trade shows offer the perfect venue for meeting new customers, networking with industry peers, and making new contacts who can help your company grow. But there’s usually a lot of hustle and bustle going on at a show, so it’s important that you have a strategy in place to ensure you make the most of your time while you’re there. You get to promote your business to thousands of potential customers, so focus on your goals and make sure you conduct business according to a plan. Make sure the trade show meets your goals, then create a marketing strategy which promotes the show to your current customers. Work in advance to get the attention of the media, and also visit other trade shows beforehand. Prepare yourself and employees, and then network your company to other exhibitors. The best thing about being able to see a lot of people face-to-face is getting the chance to really demonstrate something. Think of it like a “show-and-tell” from grade school. You could have 1,000 pretty brochures, but if you aren’t demonstrating something or letting your peers do something hands on, then you’re going to be one of the boring booths. Boring booths go by unnoticed. Don’t be boring! Make sure to set up meetings. Have a list of booths or companies you want to see. Get a map of the setup of the trade show floor. By doing these things ahead of time, you will be able to maximize your time. Visit the press rooms if they’re available at these events. Journalists are always asking the good questions, and you’ll learn some valuable insights from the top players at the show. Don’t be afraid to also ask questions; this will help strengthen your networking efforts with the person being interviewed, and help spread your brand. And finally, don’t be afraid to give business cards to journalists. When you arrive at a trade show, it’s a failure if you don’t already know before coming in that it will be a success. Trade shows are great for sharing ideas and checking the latest trends, and 95% of great meetings are scheduled in advance. You, therefore, need to invest your time well before the show to reach out to prospective customers, influencers, or potential partners to truly leverage your participation. It’s easy to get lost in all the chitchat and swag handouts at trade shows if you don’t go in with focused intention. Before the show, sit down for 10 minutes and think about who do you want to meet, what do you want to learn, and how would you define the event a success in hindsight. Now, you’ll be able to keep friendly conversations from taking up too much time from your goals of the show.